Using dog tags engraved with his name and cell phone number to pass as business cards to prospects has proved to be a productive move for an Appleton, Wisconsin, recruiter. Staff Sgt. Michael Tucker had been a recruiter for a little over two years when he came up with the idea. He first passed out the little aluminum cards in June at the Outagamie County Fair and found they generated a lot of attention and callbacks. “Everyone associates the dog tags with the Army, which is why I started using them instead of business cards,” Tucker said. 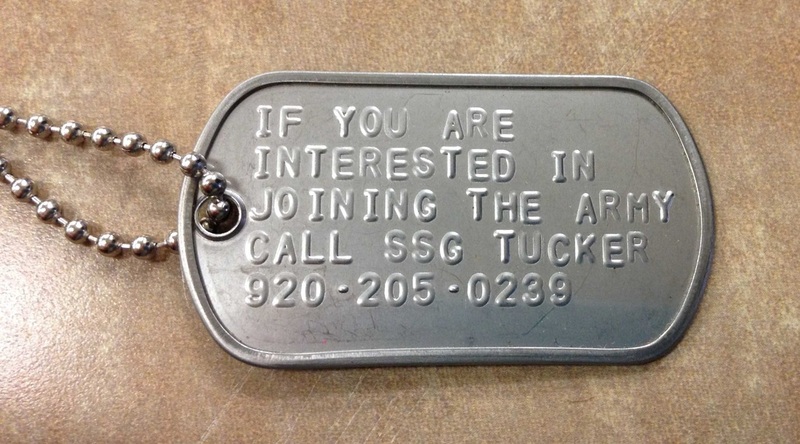 The tag simply reads “If you are interested in joining the Army, call SSG Tucker,” followed by his phone number. Tucker said he was enlisting on average one applicant a month before he started passing out the dog tags. Now he said his enlistments have more than doubled in the last six months, and he was the first recruiter at his company to reach his first quarter goal, doing so in six weeks. Tucker said he hands out the tags at schools, hangs them off shopping carts in department stores and gives them to Future Soldiers to disseminate to their classmates.